Copy by Air Mail to Government of India, Simla. Copy by post to Political Agent A mid-ranking political representative (equivalent to a Consul) from the diplomatic corps of the Government of India or one of its subordinate provincial governments, in charge of a Political Agency. , Bahrain. 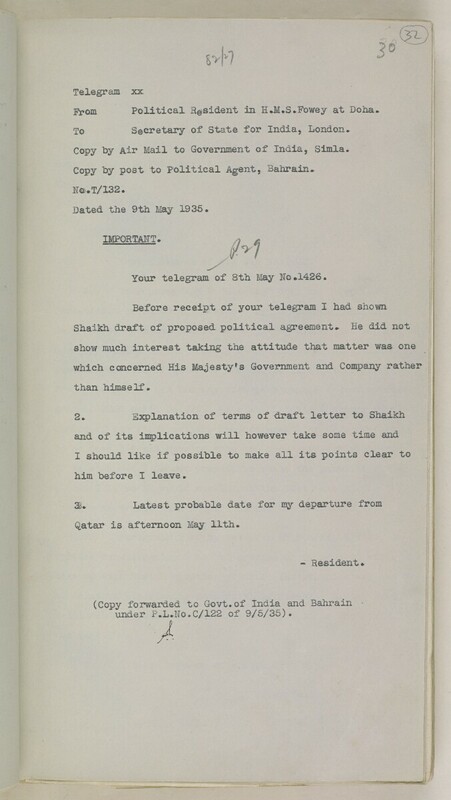 Your telegram of 8th May No #.1426. Qatar is afternoon May 11th. under P .L.No.C/122 of 9/5/36).